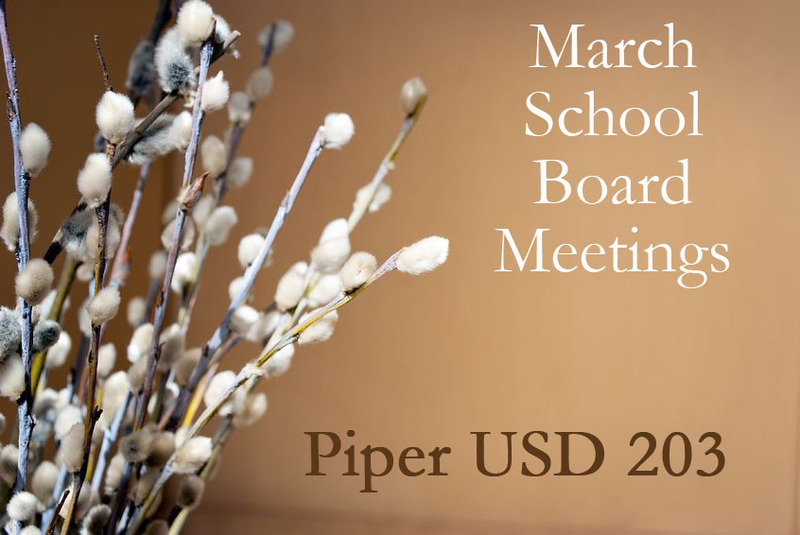 The Piper School District’s Board of Education will meet Monday, March 12, at 6:30 p.m. In addition to routine items on the agenda, such as considering a request for use of an athletic field and reviewing personnel changes, board members will hear a report from Superintendent Steve Adams. Two highlights of Adams’ report will be information about food service at the schools and about a recent meeting of the facilities committee. Regarding food service, the superintendent will share a response to the board’s request that cafeteria workers prepare more menu items from scratch. There also will be information about a Request for Proposal to be distributed to outside companies interested in managing the district’s food service program. Reporting on a recent facilities committee meeting, Adams will share the board’s discussion of the district’s need for more classroom space. Committee members decided the best long-term solution would be to build a new high school, transform the current high school into a middle school and the middle school into an elementary school. However, they did not think voters would approve the expense. Later this month, committee members will meet again to discuss what kind of expansion project they think voters might approve. According to statistics available from the Kansas State Department of Education, Piper USD 203 enrollment has increased by at least 400 students over the last decade.